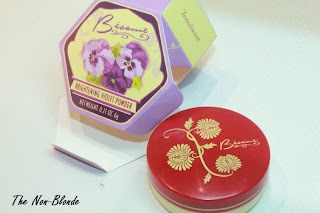 Bésame Cosmetics are known for their retro chic. They offer a small(ish) selection of makeup products (I'm a huge fan of their red lipstick) of high quality and adorable packaging. I used to have an older version of their vanilla scented loose powder and liked it a lot for the soft texture and the heart-warming fragrance, so I was happy to see a new Bésame powder- the Brightening Violet one. The small (6g) container has a built-in sifter and a cap that sits directly on top of it, securing the powder and preventing accidents even when you're on the go. It's a really nice touch that I appreciate greatly. The powder itself has a faint violet tint that doesn't create a real cast on skin but does brighten ever so slightly. I expected the powder to be heavily scented-- something like the smell of Guerlain cosmetics on steroids. While Besame powders are fragranced, it's a delicate floral scent that doesn't linger for too long. If you're sensitive to perfume in makeup or if you dislike the feel of retro cosmetics, this is probably not the product for you. Touching the powder for the first time I thought it was a bit thick and talc-like, but there's no sign of that when you apply. 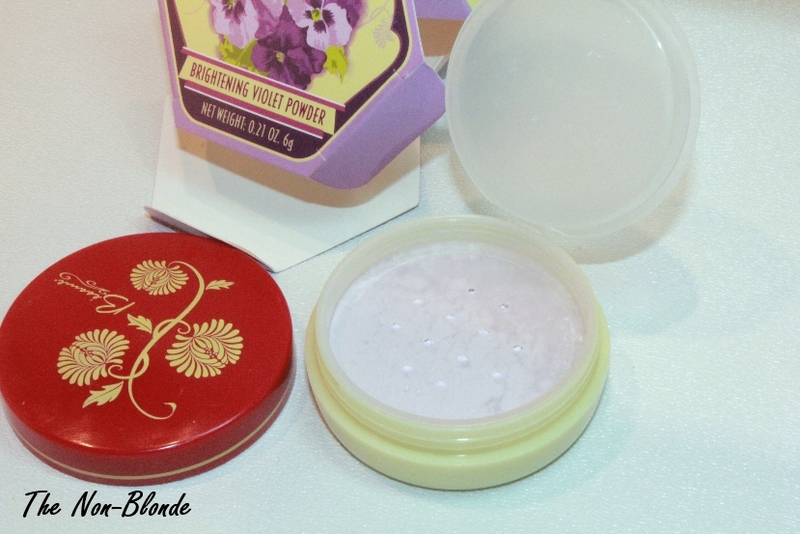 The Brightening Violet Powder disappears into the skin without a trace. I apply with a brush, not a puff, because I prefer the lightest possible touch of powder. I'd also recommend (this is what I do) that if your main concern is hiding redness and your skin is generally dry, to only dust it over a concealer. This way you set the concealer, enjoy the brightening effect, but avoid adding to the problem. Besame Cosmetics- Brightening Violet Powder ($22) is available from Besamecosmetics.com. 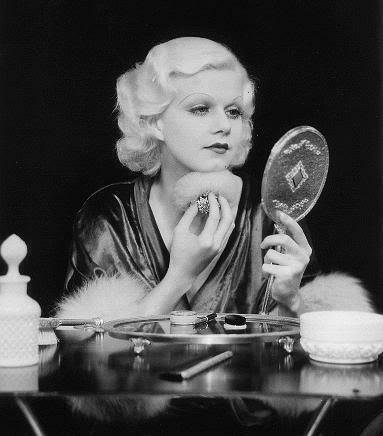 Photo of Jean Harlow via Stirred, Straight Up With a Twist. I used to love Besame, and still have stuff hoarded from right before they changed everything- there was a great sale. I need to check out what's going on there now. I agree- the lipsticks and translucent powder are awesome. Actually, I freaking love their blushes and eyeshadows too. I guess that's just about everythin. Oops! No, lip gloss too.